ST. GEORGE – If you have ever watched a medical drama when a surgeon hovering over a patient on the operating table asked for a funny-sounding tool, it’s not a nurse who hands that tool over. The proper term is “surgical technologist,” and they are integral to surgical procedures. “Not everyone in scrubs is a nurse,” Kathy Snyder, Dixie State University’s surgical technology program director, said during an open house held at the Russell C. Taylor Health Science Building Monday. So this begs the obvious question: What is a surgical technologist? “Our job is to set up the operating room for the surgeon,” surgery tech student Allysse Thomas said. In addition to being one step ahead and passing the tools, surgery technologists also make sure the operating room and everything in it are as sterile as can be. “One of the most important parts of our job is to protect the patient from getting an infection,” Snyder said. Thomas was one of a handful of students gathered in the program’s mock operating room for the open house. They talked with those who came to take a look at the program in hopes of recruiting future students. Surgical technology is a two-year program that translates into an applied science degree, Snyder said. The first year students learn anatomy, physiology medical terminology and so forth. The second year is when it pays not to be squeamish about seeing a surgeon operate on someone. 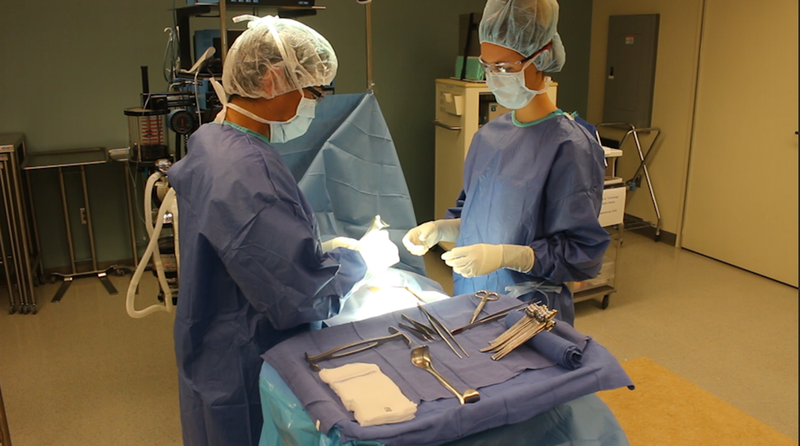 It is during this time that surgery tech students are able to gain experience in real operating rooms at nearby Dixie Regional Medical Center and surgical centers around the area partnered with Dixie State. Thomas said she participates in actual surgeries three times a week. This has allowed her and other surgery tech students to became acquainted with surgical staff at the hospital and elsewhere. This has generally led to members of the class being hired on at the hospital and other area surgical centers following graduation. Applicants to the program have ranged from traditional college-aged individuals to older persons interested in starting something new, Snyder said. The surgical technology program is an example of the direct school-to-jobs pipeline that Dixie State University continually moves toward as a part of its focus in providing a highly skilled regional work force. For additional information about Dixie State’s surgical technology program, visit Dixie State’s website.